Whether you are a DIY parent, a crunchy granola mom, or someone who does everything by the books and has no problem with pre-made formula and baby food, you are still going to wonder about how to find the best baby food and how to make it at some point. Once you get your first taste at blending a mixture of fresh and healthy ingredients together to make your little one’s first “solids,” you are either going to love it or hate it. You’ll love it because suddenly you feel like the most health-conscious parent in the world. And you might hate it because the puree turned out a lot thinner than you had hoped and making baby food isn’t really what it’s all cracked up to be. Before you get to that point, however, there are a lot of factors to consider from both sides of the coin. One of the obvious advantage of making your own baby food is that you will know exactly what your baby is eating. There’s no reading ingredients on a label or trying to figure out how to pronounce some preservative agent. Instead, you get to mic the mixtures of different fruits, vegetables, and even meat to give your baby healthy and fresh baby food every time. Instead of needing to rely on the combinations that come in pre-made baby food jars, you can figure out the combinations that your specific baby enjoys and you can feed them a wider variety as well. You can even puree some of the foods the rest of the family is eating so your little one can get used to some of the same tastes early on. Sometimes, jarred baby food at the grocery store is cooked at such a high temperature to preserve it for longer than some of the key nutrients are cooked out. By making your own baby food at a more reasonable temperature, you can ensure that all of the important vitamins and nutrients stay intact. On the other hand, some parents might prefer to buy baby food rather than make it. By purchasing pre-made baby food at the store, you get to avoid all of the time it takes to cook and puree baby food and come up with the right concoction for your infant. Baby food at the store also comes pre-measured so you don’t have to worry about that part either. Baby food manufacturers also do the work of getting the consistency just right for each stage of baby food your little one goes through. And although some parents might not love the idea of preservatives in their babies’ food, they do help to keep the baby food fresher for longer. When you make your own baby food, there is no guarantee of keeping it fresh and ready to eat for as long as you need to keep it in the refrigerator for your little one. Some parents might need to dedicate more than one day at a time to make a week’s worth of baby food for their child, only to have to do it all over again the following week. So in these instances, those parents would certainly prefer the convenience and longevity of store-bought baby food. Regardless of which method you choose, it is important to know when to introduce baby food to your baby. According to the Mayo Clinic, you can start introducing solids to your baby between four and six months old. 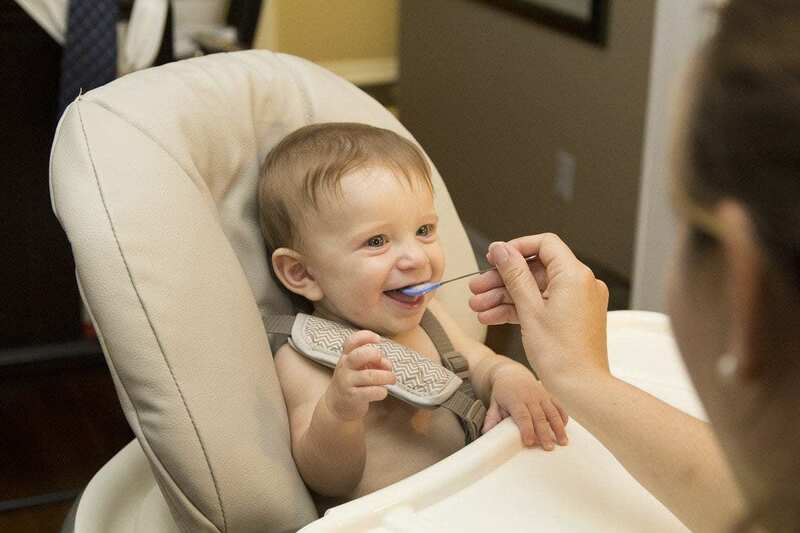 If at this point, your baby can sit up with help, hold his or her head up with ease, and has taken interest in what you are eating, then they are likely ready to start with solids. You should still be feeding your baby breastmilk or formula as usual, but as long as you start small, your baby will be on the right track. For example, the Mayo Clinic suggests that you start your baby well pureed single-ingredient baby foods. Then, you can gradually add multiple types of food per recipe, and as your baby gets older, you can thicken the baby food a little more or go with higher stages of baby food offered by your preferred brand. You can even start introducing finely chopped finger foods between eight and 10 months of age as long as your little one is ready. Once you are ready to embark on your baby food making adventure (or misadventure, however you look at it), you will need to know the best baby food makers to help you get started. Some might just puree the food, which is all well and good. But there are others that can also steam cook the food, making it easier than ever to make your own baby food. So before you do it by hand, take a look at some other options for helping you make homemade baby food. The BEABA Babycook 4-in-1 Pro Baby Food Maker does it all. Well, you will still have to decide how you want to store the finished baby food, but it can steam cook, blend food, defrost it, and reheat it, all in the same little machine. But, to be fair, it does have a relatively large capacity, especially when it comes to baby food batches. The BEABA Babycook can make up to 4.7 cups of baby food in one batch. That is easily enough to allow you to get a ton of baby food servings divided and stored away. You might prefer to do all of the cooking yourself before the puree stage, but just in case you would rather have some of the work done for you, this is a solid option. Price: On Amazon, the BEABA Babycook 4-in-1 Pro Baby Food Maker is $150. Capacity: It can hold up to 4.7 cups of baby food. Has This Been Recalled? : There are no recent or current recalls on this baby food maker. The Baby Brezza Baby Food Maker Set is another one that has more uses than simply pureeing all of the ingredients together. It can both steam cook and blend your baby’s food with the push of a button. Unlike some other baby food makers, which require you to transfer the contents of the mixing bowl to another part of the machine or empty out the water first, the Baby Brezza does it all after you start it up. However you can also opt to just steam cook or just blend the baby food and the settings are easy to read and understand, even for parents who are new at the whole baby food making experience. Price: On Amazon, the Baby Brezza Baby Food Maker Set is $91. Capacity: The mixing bowl can hold up to 2.5 cups of baby food. Has This Beed Recalled? : There are no recent or current recalls on this baby food maker. The Magic Bullet Baby Bullet Baby Care System doesn’t cook the food as some other baby food makers do, but sometimes the thing you need the most help with it getting the food pureed just right. The Magic Bullet Baby Bullet comes with two different blades to get just the right consistency for your little one and it can help you make a week’s worth of baby food in just a few minutes. The set comes with the Baby Bullet blender as well as storage containers that you can properly date and even a little ice cube tray designed specifically for homemade baby food. Price: On Amazon, the Magic Bullet Baby Bullet Care System is $60. Capacity: It can hold up to 32 ounces of baby food at once. To make baby food for your growing little one, there are a few simple steps to abide by. Once you get the hang of it, you will know how to make baby food as easily as you make food for the rest of the family, but it is important to use step-by-step instructions to get it right every time. The most important thing to remember to do is thoroughly cook all of the food you plan to use in your baby food recipe before you mix any of it together. Whether you plan to use multiple vegetables or even meat, you will need to thoroughly and properly steam, bake, or boil the food first. Of course, this isn’t necessary for fruits, but you should still chop them small enough initially. After cooking, though, set aside and keep the leftover liquid. Take the cooked or chopped food and put all of it in whatever you are using to puree it. You will have to figure out the right consistency for your baby, depending on their age and development, but you can use a food processor, blender, or baby food maker to get everything pureed and mixed. You can also puree the food for longer or for less time, depending on how thick you need it. Take the water liquid you set aside and gradually add it in while you puree to get the right consistency. It will ensure that the baby food isn’t watered down or diluted in flavor either. As your little one grows, though, you will have to add less and less liquid, making it an easier process as your baby grows and develops. Finally, figure out how you will store the baby food. You should either freeze or refrigerate the food, but before that, make sure to properly label and date whatever package the baby food is in. Opt for small jars to divide up the baby food or pour it in an ice cube tray to freeze and then pop out and thaw for your little one’s meals. Once you’ve gotten to the point of finishing that final batch of baby food for the week and you’re ready to safely store it away in the refrigerator or freezer, you’re going to need to know the proper way to do it. Luckily, there are a few ways to store baby food and keep it as fresh as possible while maintaining all of the nutritional value your baby needs from their solids. One increasingly popular way to store baby food is to pour your finished homemade baby food into ice cube trays. You then freeze all of these baby food “pods” and either pop them out and allow them to thaw before feeding your little one or pop them out and individually wrap them in the freezer. Either way, you will have properly portioned little baby food meals and they will likely stay fresh a lot longer than if you had simply refrigerated the homemade baby food. Another way to store baby food is to divide the finished product into individual baby food-sized jars and refrigerate them. This still gives you the right portions for your little one and can be convenient since you won’t have to wait for the food to thaw out. The biggest downside, however, is that this method means the jarred homemade baby food might only be good for 38 hours before you need to pitch it. If you want to freeze your homemade baby food to get more use out of that huge batch you just spent two hours making, you can opt to freeze it another way. Instead of using an ice cube tray, put heaping spoonfuls of the baby food onto wax paper and freeze them that way. Once frozen, you can pop them off the paper and place them in individually marked sandwich bags which you can then put back in the freezer for later use. If you still decide to go the other route, however, you are going to need to know where to find the best baby food and, honestly, which brands to choose from. As with most baby things, choosing baby food is not as easy as selecting a jar from the shelf and calling it a day. There are so many brands and varieties that you will need to do your homework first. Luckily, some of that homework has already been done for you. You can buy baby food in bulk at warehouse stores like BJ’s and Costco, but there are also wide selections at Target and Walmart. Or, you can buy baby food online from any of those stores as well as Amazon. In fact, with some baby foods on Amazon, you can even subscribe to them and get monthly shipments while saving money in the process. Some baby food brands are even available through Amazon Dash buttons. But before you run out and pick from the many brands and combinations out there, these are easily some of the best-premade baby foods. Gerber has a variety of different flavors, sizes, and styles to choose from to give your baby healthy and tasty meals every day. There are multiple different stages to choose from depending on your baby’s needs and tastes. From vegetables to fruit to actual meat, there are Gerber baby foods to choose from for your growing baby. The food comes in glass jars, small plastic tubs, and even pouches for older babies. Plus, you can find them almost anywhere and one of the flavors are bound to be what your baby likes. Price: On Amazon, an eight-pack of Gerber 2nd Foods Macaroni & Cheese is $11. Available Sizes: Gerber baby foods range in sizes from 2.5 ounces to four ounces. Where To Buy: You can buy Gerber baby food on the manufacturer’s website and on Amazon or in store at Target and Walmart. Has This Been Recalled? : In 2016, there was a recall for Gerber baby food pouches. You might not be too keen on all organic food for your little one, but there’s no reason not to start them off right with the Plum Organics Baby Food. It comes in a variety of different flavors and stages to accommodate your infant as he or she grows and give them a ton of different food combinations to choose from as they figure out what they like. The food is totally organic and GMO-free while also being free from salt and added sugars, so you can rest easy knowing your baby and, eventually, your toddler is getting the nutrients they need without unhealthy additives. Price: On Amazon, a pack of 12 four-ounce pouches of Plum Organics Baby Food is $14. Available Sizes: Plum Organics come in containers that range in size from 3.6 to four ounces. Has This Been Recalled? : There was a 2013 recall on Plum Organics pouches. If you go with Beech-Nut Baby Food, you get another non-GMO all natural baby food that is the next best thing to actually making your baby food yourself. It comes in different stages and foods to start your baby off right with gentle fruits and vegetables as they eventually move into more complicated food combinations. Beech-Nut also makes different baby cereals, but if you’re after jarred baby food or pouches for older babies, Beech-Nut has plenty of options for your little one. Price: On Amazon, a 10-pack of 4.25 ounce Beech-Nut Baby Food is $21. Available Sizes: Beech-Nut Baby Food comes in sizes from 3.4 to four ounces. Where To Buy: You can buy Beech-Nut on Amazon or in-store at Walmart and Target. Has This Been Recalled? : There are no recent or current recalls on this baby food. There’s no right or wrong answer to the question of whether you should make or buy baby food. You might even decide to go with both options and alternate between making baby food and giving your little one jarred baby foods when you run out of homemade baby food. In both cases, though, there are lots of options for you. You can find some of the best baby food brands online and in-store and making baby food yourself is honestly easier than ever. But buying baby food can be a daunting task with how many different brands are out there right now. To the same tune, making baby food can seem like a difficult task for even the most experienced parents. Doing the research first is always best and now that you know the steps in making baby food and the top baby food brands to buy at the store, you really can’t go wrong either way.